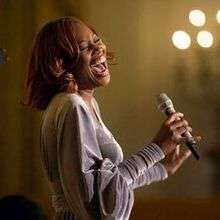 This is the discography of gospel artist Yolanda Adams, an American multi-platinum selling Gospel music singer and radio show host. She has sold 4.5 million albums since 1991 according to Soundscan. 2001 Yolanda Adams and Albertina Walker "The Divas of Gospel"
2000 "Shining Star" Yolanda Adams Music From & Inspired By Jesus: The Epic Mini-Series Sparrow/Capitol Cover of an Earth Wind & Fire song. 1 2 3 "Recording Industry Association of America". RIAA. Archived from the original on February 25, 2013. Retrieved 2011-11-02. ↑ "Ask Billboard: Madonna, Yoko Ono, Gospel". Billboard. 2009-09-18. Retrieved 2012-02-19.